Time to discuss the second loner in the game, Cyan. While every character in this game has some form of tragedy, I think I feel for Cyan the most. 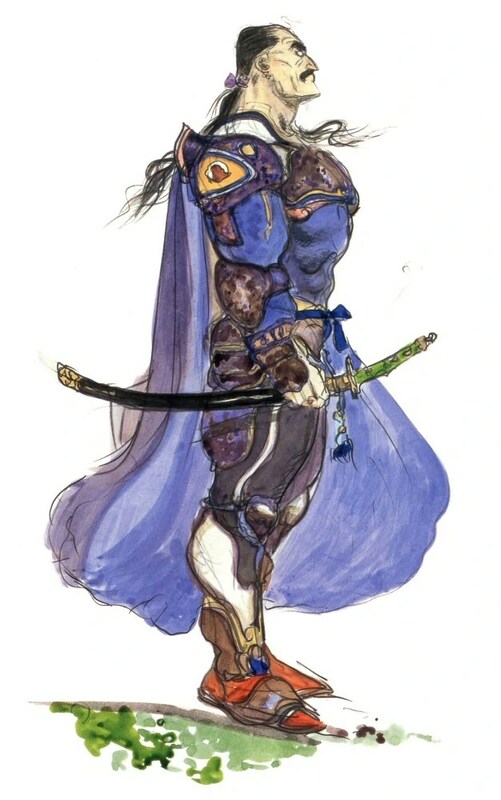 Cyan Garamonde is a samurai and higher-up soldier of Doma. When Sabin and Shadow arrive to Doma Castle it is under attack by the Empire. General Leo of the Empire, possibly the only reasonable person from the Empire, who was in charge of the assault has to attend to other matters leaving Kefka as the leader of the assault. Kefka, rather than attacking the castle with the forces given him, poisons the entire river with no regard for anyone inside, or even his own soldiers. Cyan watches as his King dies in front of him, and finds his whole family killed by the poison. Filled with rage he goes on a rampage attacking the entire Empire encampment, and with the help of Sabin, Shadow and some Magitek Armor (Random Fact: Cyan has a phobia of technology.) they destroy the encampment with only Kefka getting away. Oh and it’s not over yet. Following this event, Sabin, Shadow and Cyan travel through the Phantom forest where there is a train that takes the dead from this world to… somewhere, the Phantom (Ghost) Train. The party gets stuck on this train, and in the end has to fight it to stop it so they aren’t brought to… somewhere. Well, the train stops at a station, the party gets off, and as the party leaves Cyan’s wife’s and child’s spirits are seen getting on the train. This event happens RIGHT after them dying in Doma castle. Thanks for rubbing it in Square. This turns Cyan into more of a baus then he already was, and now has a scary revenge side to him. I find Cyan’s Amano artwork extra exceptional. Not only is he portrayed as manly and epic as he should, but he is drawn in a side view as he looks off into the distance. After the tragic events that happen to Cyan are past, he is the lone avenger (there is a scout of some sort that also survives, but I do not recall what happens to him. He plays no important role later in the game.) of his kingdom Doma, and he is living alone without his wife and child. The look given to him by Amano is also that of having a goal in mind. The goal of revenge. His sprites depict his baus samurai self very well, and I even find that his eyes show his anger that’s there, hiding his sorrows. I find Cyan’s theme to pretty similar to Shadow, and this makes a lot of sense. Both Shadow and Cyan are left without their wives, and both of them are the whole “Lone Ranger” kind of path. However, Cyan’s theme has a timpani and low brass part consistently playing the same heroic and noble-sounding rhythm separating the two of their theme’s through their moralities. Like just about everyone of the character theme’s in the game it has two parts. The second part of Cyan’s theme keeps the rhythmic idea representing his nobility, but with more freely sounding strings on top. I think this is showing another side of Cyan, and actually given his character personality more depth than the man that lost his family and kingdom. This is something that I don’t find often expressed in character development. A game can do a fantastic job of showing why a character is a certain way, and give a character a great story, but often they don’t try to show what the character was like before the events of the game (unless there’s flashbacks, time travel, or something of the sort. ), and this theme seems to do that. I like to think that the more freely sounding string section gives a little in look into Cyan’s childish want to explore and wonder, but being the noble man that he is, gives it up to marry and protect the people he cares about. That idea fits Cyan really well, and would explain why he’s the way he is even more.